Remember those cartoons that were shown to you as a kid in which tooth decay would be presented as a kind of medieval epic with mighty white knights battling their evil counterparts.? 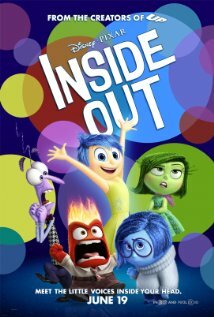 Pete Doctor and Ronaldo Del Carmen's Inside Out takes a similar approach to the neuropsychology of the brain. "Do you ever look at someone and wonder what is going on inside?" is the question this Pixar animation poses at the beginning. Riley Anderson (Kaitlyn Dias) is born with Joy (Amy Poehler), Anger (Lewis Black), Disgust (Mindy Kaling), Fear (Bill Hader) and Sadness (Phyllis Smith). They are the committee that is constantly meeting in her head and that in the first years of her life commune copacetically with her loving parents Diane Lane and Kyle MacLachlan. Then the equanimity that has previously reigned within the child's psyche (with disgust limited to stimuli like broccoli) gets sorely tested by a move from a bucolic existence in Minnesota to San Francisco. This is the point at which the movie also makes a furious jump from something simple that most kids can identify with to concepts, that would be way above the ken of most children and adults too. Joy's role becomes that of preventing Sadness from reconsolidating Riley's core memories, which, in lay language, means simply changing them. This process is a hot subject in neuroscience today. In the course of the movie Joy and Sadness find themselves chasing a train of thought through the depths of the subconscious and back to "headquarters," aka the executive functioning of the brain. Naturally such trains can only be ridden when Riley is not sleeping. The disintegration of Riley's personality is not child's play. The art of this animation is the way in which it functions as both a fairytale and a story about defense mechanisms and repression. The average neurotically inclined adult will likely come away with an unsettling feeling of "deju vu" (one of the many mental states alluded to in the movie) about the "apres coup" following early traumatic experiences.